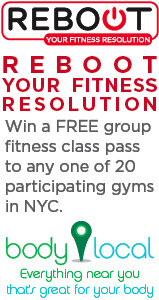 Body Local and Reboot have teamed up this Spring to help New Yorkers renew their commitments and reinvigorate their bodies for a fantastically fit summer by giving away 300 free passes to some of the hottest fitness studios and group exercise classes throughout Manhattan and Brooklyn and we’re one of them. Click here to enter to win!. This entry was posted in Blog by jtd-admin. Bookmark the permalink. Oh December, how I love and loathe thee! The holiday season is a challenging time for everyone. Yes, even for the gym obsessed, kale-eating folk like myself. I, too, succumb to the party-hopping, dessert-eating, shopping mania frenzy this time of year brings. That’s right, I’m a sucker for baked goods and I definitely eat a few too many cookies and breakfast pastries on some days. But, I have found ways to have fun and indulge without throwing away all my healthy habits. 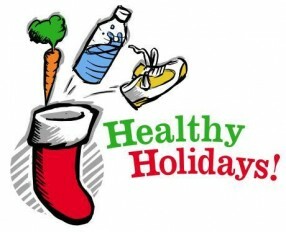 Check out a few of the strategies I use to help make my holidays a little bit healthier and lot more enjoyable! Keep Moving. This is not the time to skip your workouts. Get your shoes on and get moving. Hit the gym, hit the pavement, hit the living room floor, or rally the troops for a local holiday fun run – just get that heart rate up for at least 20 minutes a few days each week. You’ll look good, feel great and have more energy to get things done. Plus, exercise releases endorphins, which helps keep that pesky holiday stress at bay. Keep Healthy Snacks Handy. Temptation is everywhere this time of year. Focus on eating as healthy as possible on days you don’t have functions. Don’t skip meals and always have healthy snacks such as sliced vegetables and nuts at your fingertips. Modify Your Recipes. It’s easier than you think to cut calories and fat from traditional recipes. Swap out the sugar for stevia (a natural sweetener found in the sugar aisle). And instead of butter, use pureed bananas, unsweetened applesauce or Greek yogurt. I promise, they’ll taste just as delicious as you remember! Be Picky at Parties. There is nothing more enticing than a creamy Brie cheese and crackers. But, this month, I’m saving those calories for the fudge and Mom’s homemade pasta. When attending parties, think before you eat. Opt for a smaller plate, choose the items you really like and avoid the stuff you see all the time. Vegetables are the exception, of course! Don’t deny yourself the special treats you have waited all year for. Indulge…just on a smaller scale. Hydrate. Water is key. It fills you up, keeps cravings in check and detoxifies the body. Beware of Booze. Liquid calories count too! Choose wine over beer and avoid tonic and other sugar filled, calorie dense mixers like juice and soda. Opt for tap or seltzer water instead. Remember to Chill. There’s a lot going on. Don’t forget to take time for yourself. Take a walk, give yourself a massage – just relax! So, go on…eat, drink and be merry. Just do it in moderation and make it a point to move a little more this season! 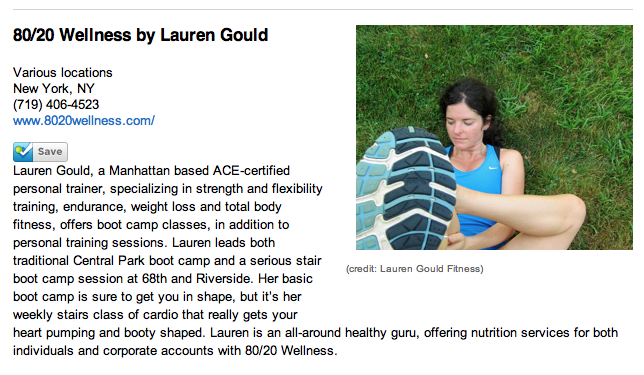 This entry was posted in Blog by Lauren. Bookmark the permalink. I never used to run, I used to despise it to be honest. And then I gave it a chance and eventually fell in love. I am not saying you have to love or even like running, but at one time or another I am sure you have all desired to run that 1 mile without having to stop. If I am wrong, read no further. For those of you that are sick of being intimidated by the hills in Central Park or the treadmills at your gym, join me once a week to learn how to improve your strides. The training plan we will follow is designed to get you to the point where you can run 30 minutes at a slow, relaxed pace. Research has shown that just 30 minutes (roughly 2 miles) a few days a week is enough to help you maintain many health markers: weight, cholesterol, insulin response, and blood pressure just to name a few. This is a progressive program where we will begin walking more than running, and gradually you will turn that walk into a run. Let’s get started! This entry was posted in Blog and tagged Central Park, Purpose, Running, Training Plan, Workout by jtd-admin. Bookmark the permalink.